After a week of fine dining, rich foods and haute cuisine, it was time to get back to my roots. 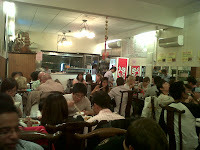 So I catch up with my peeps, Brandon and Gihan, and we take a drive down to Good Fortune on William Street in Northbridge, Western Australia - your quintessential hole in the wall Hong Kong barbecue joint with roast meats hanging in the front window. It's just north of the corner with Newcastle Street. As you can see from the photos, nothing flash. But that's more than made up by the food! And the fact that it's packed on a Monday night speaks volumes. 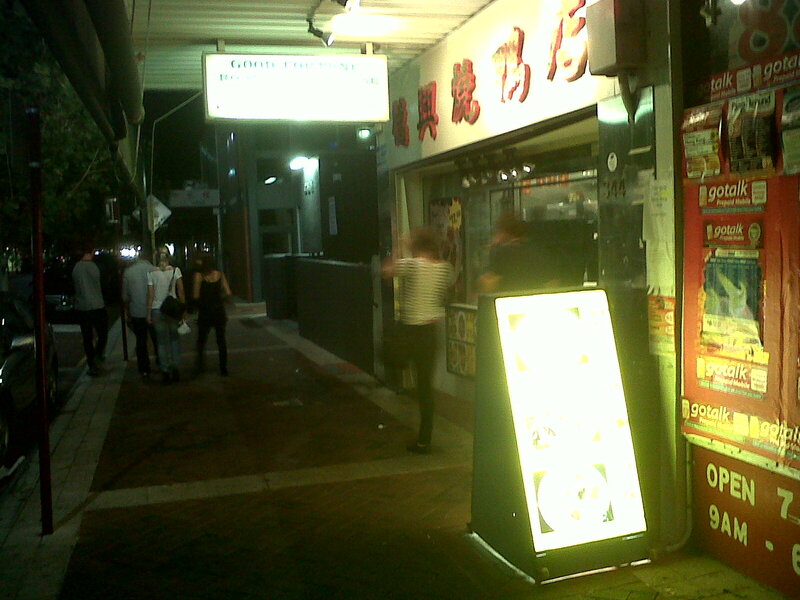 The good thing about Northbridge on a Monday night is that it's nice and quiet. It's probably also helpful that we're at least one block away from the nearest bars and nightclubs. Okay - we had a mixed roast meat platter, with 2 choices. I picked roast duck (that's what they're supposed to be renowned for) and the roast pork (or "siew yoke"); garlic chilli fried squid; sambal kangkong (similar to spinach, but crunchier); and one of the house specialties: Teochew soy duck with beancurd. 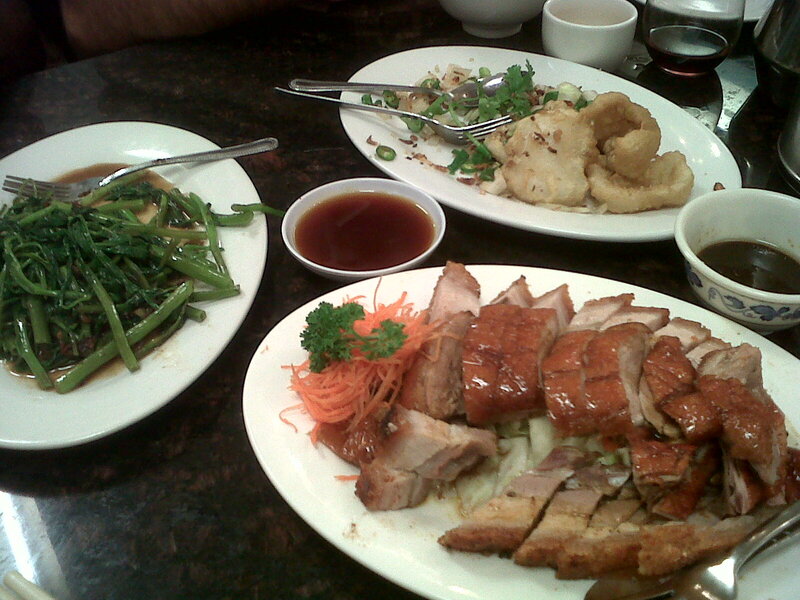 The two duck dishes were like apples and oranges - completely different tastes and textures. You just have to try them to understand. 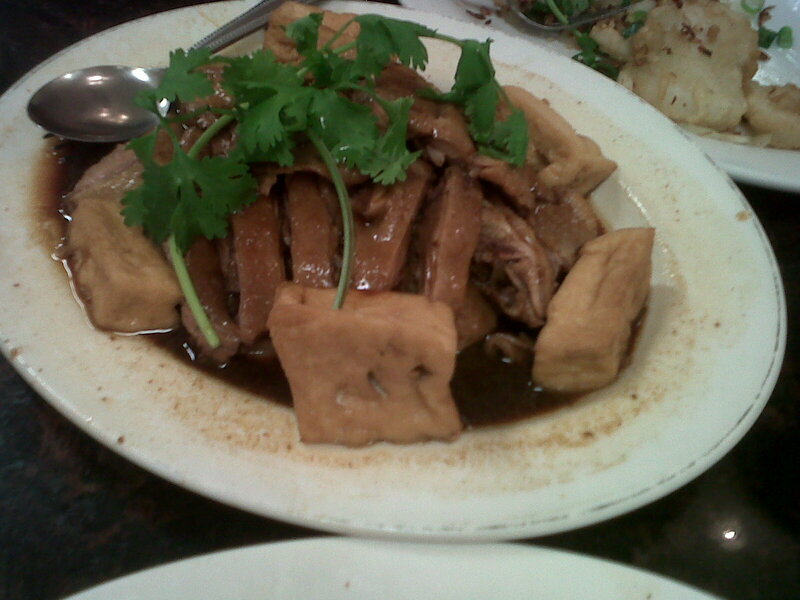 The beancurd in the soy duck dish were also delightful - having soaked up the light gravy, it unloads the flavoursome goodness in your mouth like a sponge. The garlic chilli squid was also delicious - the batter was light and it wasn't overly oily. And loads of garlic - yummo. Good thing all of us were eating this. The sambal kangkong was a very nice balance of spiciness and flavour - not overly hot, but with enough of a bite to match the crunchiness of the greens, with a rich smokey flavour from the dried shrimp paste in the sambal. Oh and did I mention that this place is BYO? I don't think that they even charged us corkage. Tip for the unwary - bring your own wine glasses, especially if you're bringing something nice. Otherwise you might have to drink it out of a teacup. As you can see, we brought little Riedel stemless glasses, which are perfect for transportation, and for its perching stability on a small table crowded with plates. As I had recently moved house, I discovered all these old wines from my cellar that appeared to be in desperate need of drinking, given their age. One of these was my last 2001 Hay Shed Hill Pinot Noir, purchased at a firesale price when the receivers took over the previous incarnation of the winery some 10 years or so ago. You would have to chuckle if you were there to see our faces as we tried the wine - faces scrunched up in anticipation of a vinegary aroma and acidic, mud-tasting, over the hill wine. We were in for a very pleasant shock indeed. A leafy, dark berry aroma greeted us, and the flavour was truly delicious. Leafy, almost minty topnotes, with a juicy cherry, blackcurrant body laid on top of just the hint of an earthy backbone. A perfect match for the duck, and all the other dishes too! 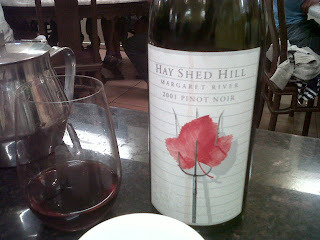 There you go - a 2001 Hay Shed Hill Pinot Noir is still drinking beautifully after 10 years. All up, it cost us around $25 each. Given that we had picked the gourmand rather than gourmet hat tonight, we had over-ordered and were thoroughly stuffed full. You would probably get a decently satisfying feed for less than $20 a head if you didn't go overboard with the quantities. 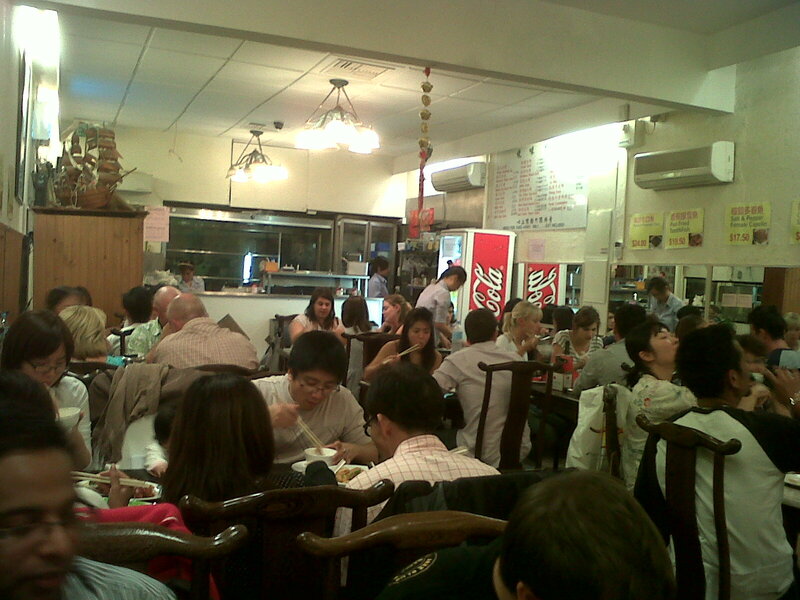 There you have it - it was certainly our Good Fortune to eat at this restaurant!